Angel Calloway is no saint. But when the rough and reckless mercenary shows up in Somerset, she makes a lasting impression on the young Mackay girls, especially Bliss. Their mother Chaya, on the other hand, plans on keeping a suspicious eye on Angel. As the wife of the notorious Natches Mackay, she can tell when her family is being played. So What Did I Think Of Nauti Angel by Lora Leigh? This story had me in its grip from moment one. The emotion was so clear and intense, my interest was instantly peaked and I wanted to know more. The characters were so developed and down to earth that it made things much more enjoyable. The drama was so complex and raw and non predictable. I was really on edge to see how thing would all play out. I really liked the fact that it wasn’t so clear cut how things would go and if the main characters would find their HEA which brought up the anticipation. Then there was the high action that went well with the story. The writing was smooth and easy, allowing me to easily get into the story. Now there was a sizzling romance that developed during all of the drama but I felt it took a bit of a back seat to all the family drama going down. I felt it wasn’t as intense as it could have been. Since the couple knew each other before I felt somethings were left out. The couple had worked together before even though they weren’t a couple back then it sill felt like a second chance romance to me which is not my fave cause I miss too much. Their meet-cute, initial feelings est. but it was still enjoyable. 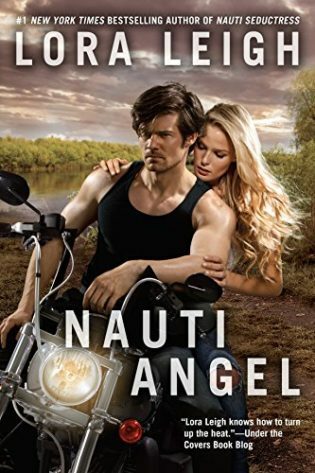 Overall I really enjoyed reading Nauti Angel by Lora Leigh and I look forward to reading more in the series.